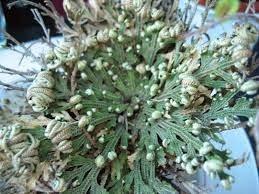 The Resurrection Plant is one of over 700 species in the Selaginella genus of plants. All of them are primitive plants, fitting somewhere between mosses and ferns in the hierarchy of plant evolution. They belong to a group of plants known as the lycopods, whose members go by the common names of ground pines and club mosses. All are relatively small (up to one foot tall) and are found around the world, usually in moist locations with mosses and ferns. They reproduce by single-celled spores, and lack flowers, fruits and seeds. Even their "leaves" are not really leaves, but instead leaf-like extensions of the stem. What lycopods consist of then are roots, stems with scales, and club-like strobili that produce spores. What distinguishes the Resurrection Plant from most other lycopods is where it lives and how it copes with its environment. Found from Texas and Arizona south to El Salvador, the Resurrection plant is a desert inhabitant. Growing from rock outcroppings or in dry soil, its close neighbors would be mostly cacti and other arid-loving species. Under these conditions, most other lycopods would perish, but the Resurrection Plant thrives. When the soil is moist after infrequent rains, a Resurrection Plant absorbs water and grows rapidly, producing a flat rosette of scaly stems up to one foot across. As the soil dries, it cannot store water like its succulent neighbors, so it folds up its stems into a tight ball as it desiccates and goes into a state of dormancy. The folded plant has a limited surface area, and what little internal moisture is present is conserved. All metabolic functions are reduced to a bare minimum and it appears to be dead. The plant can remain in this dormant condition for years. When the rains return, the plant's cells rehydrate. The stems unfold, metabolism increases, and growth resumes. Even dead Resurrection plants will unfold if given water, since rehydrated cells expand even if there is no living protoplasm in them. The Resurrection Plant's ability to seemingly return from the dead certainly justifies its common name, and has led to its use as a novelty plant. Collected from the wild in the South West US and Mexico, it is sold to tourists and exported worldwide. The Resurrection Plant, also know as Selaginella lepidophylla, is aptly named due to its ability to "return from the dead". This interesting and intriguing plant, which thrives in desert conditions, has the ability to lie dormant and shrivel up into a ball when the moisture content of its soil dries up. It will appear to be dead, but actually, it is not. With just a little moisture added, the Resurrection Plant will begin to absorb the moisture; it will unfold from its ball and begin to grow rapidly. During this time, this exotic houseplant will produce a flat rosette of scaly stems and leaf structures. These leaf structures are actually extensions of its stems. 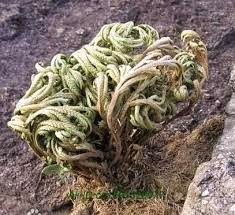 When the soil is permitted to dry out, the Resurrection Plant will once again fold up into a ball and go dormant. The plant can remain dormant for years. This behavior is why the Resurrection Plant is on the list of exotic houseplants that are finding themselves in people's homes. The Resurrection Plant, which is also called the Rose of Jericho is actually a plant that is classified somewhere between a moss and a fern. This small plant is very easy to care for; place it in a shallow dish and watered it periodically. It can also be planted in a shallow pot with potting soil. It is important to remember that this interesting exotic houseplant grows when its soil is moist. This moisture causes the plant cells to rehydrate, the stems to unfold and metabolism to increase allowing growth to occur. So, for growth to occur, water is important, more important than any other element. The unique nature of the Resurrection Plant does not end with its ability to become dormant in drought conditions. Its uniqueness carries over into the way to reproduce as well. Propagation for this exotic houseplant occurs with single-celled spores produced by the plants club-like strobill. Unlike most plants, this exotic houseplant has no flowers, no seeds and no fruits. With the way this plant reproduces it does not generally occur when kept indoors. It may actually be difficult to propagate at all.